Eight people who took part in the challenge have been treated at the burn center of Chicago's Loyola University Medical Center since the deep freeze happened last week, spokeswoman Chris Vicik said. They had injuries to their "feet, arms, hands, face, and degrees of burns, as well, "she said. One person sought treatment at the University of Iowa Burn Treatment Center in Iowa City, spokesman Tom Moore said, and Hennepin Healthcare in Minneapolis said a" couple "of people were treated there in recent weeks. It's not just the people throwing the water who are getting hurt. Some of the burn victims in Chicago have been watching the stunt. That's also what they're finding at Hennepin Healthcare, said Angie Whitley, the clinical care supervisor in the hospital's burn center. "Some of them being parents or adults (who) go outside with their kids to do it, and the kids get excited and step in the way, and the parents end up throwing the water on the children, "Whitley said. 1; so we see some face scraped injuries from that, "she added. A breakdown in the polar vortex, which normally circulates strong winds around the northern pole, sends that icy blast southward in the past couple of weeks. 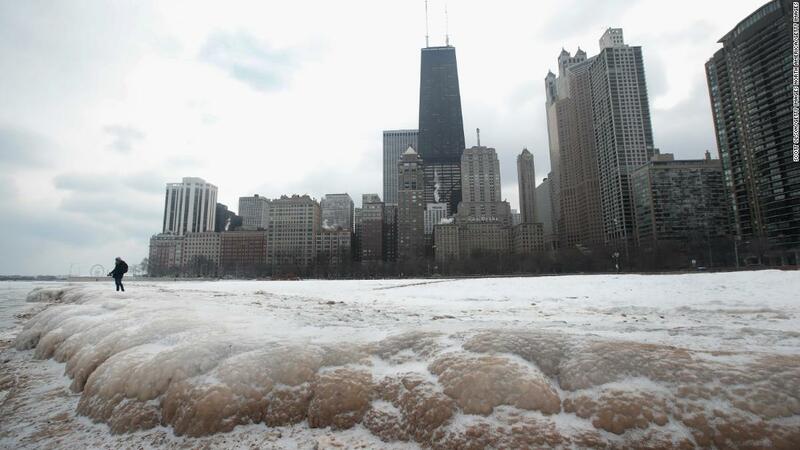 Nearly three-quarters of the population of the United States experienced temperatures at or below freezing; in Chicago temperatures plunged to minus 21. Having any bare skin in weather that is cold is its own problem, because it poses a risk of frostbite. "When it's 20 below, it's a bad idea to have uncovered skin, "said Dr. Jeff Schaider, chairman of emergency medicine at Cook County Health in Chicago. Even worse is getting water on that just skin, he said, because it will accelerate the freezing of the skin, and increase the risk of a cold injury to the skin. "The gamut runs from essentially being burned from hot liquid to being exposed to the cold air," he said. "If your hand has water on it, that's pretty quick. That's a bigger risk, actually." While the most common are first and second degree burns to the hand, Schaider said, resulting in pain and blisters, the worst cases could involve skin grafts. "It's tempting to try," Schaider said. "It looks like it's pretty cool, but it's probably a bad idea."